Every Subaru suspension bushings of our Subaru WRX had two lifetimes of wear and needed replacing, but we don’t just replace parts here at MotoIQ. We will be completing our suspension refresh by upgrading our WRX with Whiteline Bushings kit, Anti-lift kit, and Roll Center Correction Kit. The Whiteline Rear Essential Vehicle bushings kit – WEK074 contains the essential Subaru suspension bushings to activate better grip for the WRX. The Whiteline Front Essential Vehicle bushing kit – WEK076 includes front anti lift / caster kit, positive shift gearbox kit, steering precision rack and control arm bushings that restore tightness to the Impreza WRX suspension and add performance by correcting the geometry and reducing deflection caused by soft rubber bushings. Subarus are known to rear-up under power during corner exit and hard launches. This is due to Subies having a large amount of anti-dive in their front suspension geometry. The anti-dive in the WRX was designed by the factory to help reduce nose-dive under braking. However, this same geometry also causes the nose to lift when the torque is applied in the opposite direction by the engine! The anti-dive also causes the suspension to get bound up under braking. This makes it more likely for the front end of the car to hop over bumps under braking. The bind can also contribute to understeer if the car is trail braked. What the anti-lift kit does is lower the rear pivot of the lower control arm to reduce the amount of anti-dive in the suspension geometry. It also moves the pivot outward, canting the control arm forward giving about half a degree more positive caster. This helps straight-line stability, gives the steering more self-centering torque, helps steering wheel return and gives the outside front wheel more negative camber when the wheel is turned. This all results in more front traction during cornering. Finally, the anti-lift kit has a hard urethane bushing that reduces deflection under load for truer alignment under cornering stress and more response to steering inputs. Made of CNC machined billet aluminum, the anti-lift kit gets you noticeable performance gains with no drawbacks! We will be controlling brake dive with our greatly superior front struts with more damping and better springs! With the anti-lift kit, the car’s behavior will be more natural and the car will find more grip, especially on turn in and corner exit. The Whiteline Roll Center and Bump Steer Correction Kit – KCA313, moves the pivot points for the ball joints and tie rods downward. This corrects the roll center location to a near stock position in a lowered car without increasing bump steer. 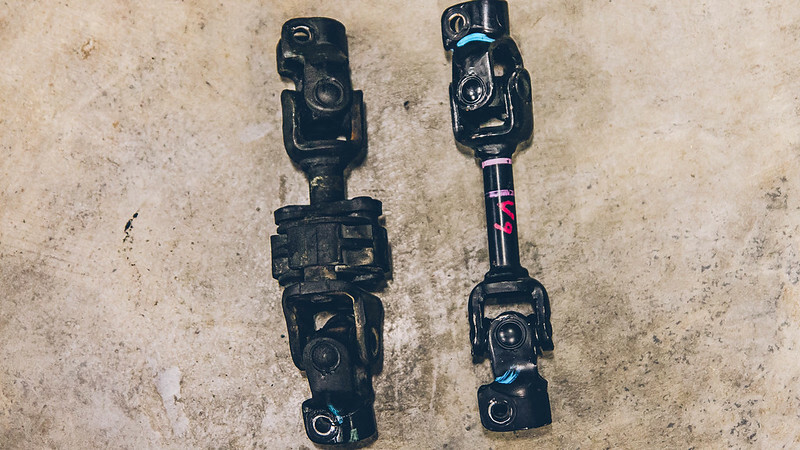 When a car with a McPherson strut suspension is lowered the control arms end up tilting upward compared to stock, changing their relationship to the inner control arm pivot point. This causes the roll center, or the geometric point in space that the car rolls around in a corner, to get lower. The distance from the roll center to the center of gravity is called the roll moment. This is the lever arm that centrifugal force works on to cause your car to roll over in a turn. When the car gets lower, the roll moment gets longer and your car might have a greater propensity to roll despite the center of gravity getting lower from the lowering! Also, as the control arms start to point upward the strut starts to move inward under compression, causing you to start losing negative camber under roll. That’s the opposite of what you want to happen! You want to put the tire contact patch flatter on the road under cornering loads. I have a lot of the same parts on my 2005 WRX and absolutely love them. One question, if you needed to replace the rack is there a reason you guys didn’t upgrade to the 2015+ rack? There’s a bit of fabrication needed to make it work on a GD but I’m really glad I did it. Keep the GD WRX updates coming, I’m really enjoying them. We didn’t do it because of the fabrication needed and the Whiteline solution works fine. I would highly recommend swapping the WRX U-Joint for the GD STi one. The WRX has a large rubber bushing in it, while the STi is a solid linkage. They can be found used for about $70.